The Apollo 15 Command Module, with Astronauts David R. Scott, Alfred M. Worden and James B. Irwin aboard, nears a safe touchdown in the mid-Pacific Ocean to end lunar landing mission. 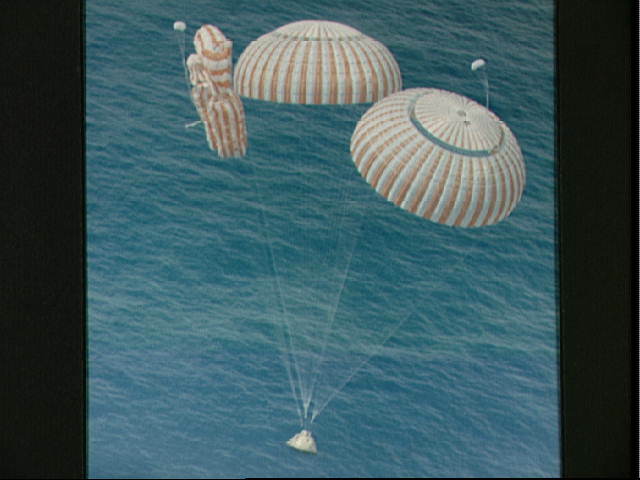 Although causing no harm to the crewmen, one of the three main parachutes failed to function properly. The splashdown occurred at 3:45:53 p.m., August 7, 1971, some 330 miles north of Honolulu, Hawaii.